This Monday, June 6 to Friday, June 10, Biafrans and friends all over the world will commence another round of phone campaign to officials of United States of America (USA); European Union (EU); and United Nations (UN). Any moment from now, the Nigerian Army will declare a dusk to dawn curfew in Onitsha, Anambra State. They will be doing this to enable them dispose of the bodies of Biafrans they killed during the last Biafra Fallen Heroes Remembrance Day rally, held on Monday, May 30, 2016. The Army is already preparing grounds to make the rally effective by brutalizing the people in the streets of Onitsha, with the hope of striking fear into them, which will make them obey the curfew. This current situation in Onitsha is to form part of the message in the phone campaign to the US, EU and UN officials. Biafrans and friends of Biafra all over the world are expected to be part of this campaign. Everyone is to call and declare to them the plight of Biafrans and why they should help to save the souls of Biafrans (SOS). 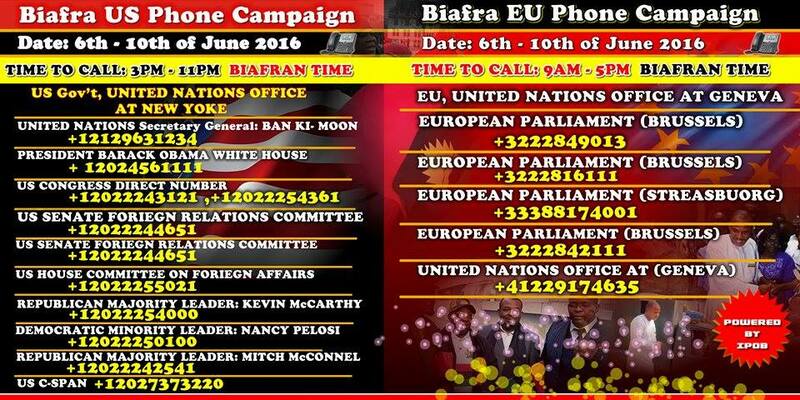 Time to call is (3pm to 11pm Biafran Time) Biafra is going places and there is nothing the enemies can do about it. 1. Investigate the recent killing of peaceful and none violent Biafrans at their last Biafra Fallen Heroes Remembrance Day Rally by Nigeria Police and military; and to punish those found to have played a part in committing the atrocious act. 2. Plead with them to force Nigeria forces of occupation – the military and Police – as well as to stop the Buhari led Nigerian government to stop the murder of Biafrans. 3. Ask them to help in working to free the leader of Indigenous People of Biafra (IPOB), Nnamdi Kanu – the prisoner of conscience. Tell them how he was illegally abducted for exercising his right under United Nations rights of Indigenous peoples and self-determination.